I skip the bike today which is probably wise with the state of my wrist (latest injury) and the state of my brakes. The bus is actually on time. I receive a rash of emails about the Black Friday sales. Whatever they are. The latest invention to get people to visit something called 'shops'. I last went in one sometime last century. Think I'll give it all a miss. They'll be another sale along in a minute. 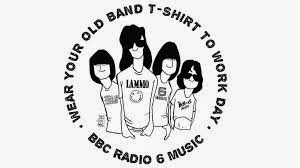 As well as Black Friday day it’s also ‘Wear your band t-shirt to work day’ today. Bugger. I’ve got a bloody running t-shirt on under my work shirt. Later L is waiting for me at the bus stop. We consider not going home and going straight to the pub but that would probably be a bit unfair on the dogs.